Building on its 1U Data Center Optimized and 2U Twin SuperServer® models, Supermicro® has developed several performance-per-watt optimized SuperServer@ systems to meet these stringent efficiency requirements. 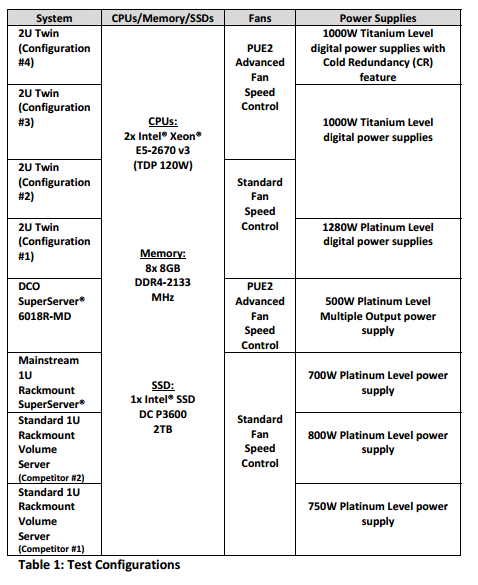 The below describes the configurations (Table 1) and test results (Chart 1 and Table 2) for the Supermicro® 1U and 2U efficiency optimized servers compared to today’s best standard 1U rackmount volume servers. The results show that data centers can substantially improve their power savings by 35 watts per node, which translates to over $5 million in savings over a 4-year period for a 10,000 node server deployment. Three standard 1U rackmount volume servers from different suppliers were used as baselines for the testing. For direct comparison, a Supermicro® SYS-6018R-MD 1U Data Center Optimized (DCO) system designed for Hyperscale environments was also tested. The other four systems tested were optimized variants of the standard Supermicro 2U Twin (SVS-6028TR-DTR) SuperServer® system with 1280 watt Platinum Level (94%) digital high- efficiency power supplies (Configuration #1). Configuration #2 was a SYS-6028TR-DTR modified with high-efficiency 1000 watt Titanium Level (96%+) digital power supplies. Configuration #3 was similar to #2 but with Supermicro® PUE2 advanced fan speed control enabled. Configuration #4 was similar in hardware configuration to #3, but having the Supermicro® Cold Redundancy feature enabled. The configuration of all eight systems tested is outlined in Table 1. The components including CPUs, memory, and SSDs were identical. The BIOS settings and test environments were also identical except where noted. Power Efficiency (GFLOPS/W) = HPL Score / Average Power From the High Performance LINPACK score and average power generated during the test, power efficiency in GFLOPS per Watt were calculated for each of the eight systems and graphed in Chart 1 below. The Supermicro® optimizations resulted in significant improvements in the performance-per-watt of the 2U Twin, to 19% over that of the standard 1U rackmount volume server (Competitor #1) as indicated in Chart 1. Further details are provided in the discussion below. 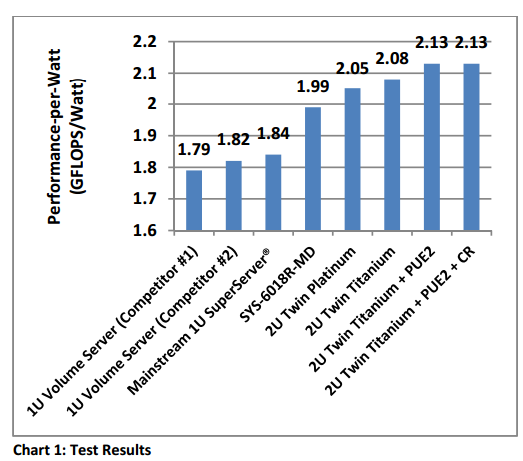 The best testing result, 2.13 GFLOPS/Watt, was generated by the most optimized ZU Twin system. The lowest testing result, 1.79 GFLOPS/Watt, was produced by a standard 1U rackmount volume server (Competitor #1). The difference in performance-per-watt between these two sen/ers was 19%. The other five systems/configurations provided results that were intermediate between these two values. The SuperServer® 6018R~MD 1U DCO server was superior to the standard 1U volume servers due to side-by-side CPUs for non-shadowed cooling, more efficient power supply, optimized serverboard, and short-depth chassis for more efficient air flow. The standard model Supermicro® 2U Twin (SYSs6028TR— DTR), with two server nodes in a 2U chassis, is more power efficient than a pair of 1U rackmount servers because it is designed with larger customized heat sinks and larger fans to provide improved cooling. 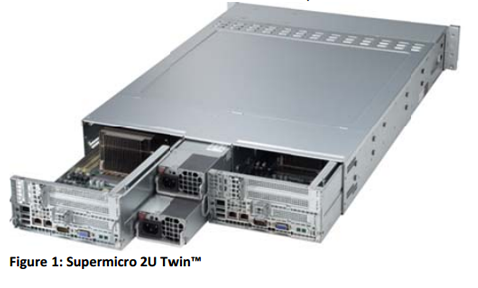 The Supermicro® 2U Twin configured with Titanium Level power supplies consumed less power than an identical 2U Twin system configured with Platinum Level power supplies due to its improved power efficiency, thus improving performance-per-watt. The PUE2 advanced fan speed control, which tunes fan speed to CPU power, provided an additional level of performance-per-watt improvement to the Supermicro® 2U Twin. A final level of optimization was achieved with the Cold Redundancy feature available with the Supermicro® 2U Twin. This allows the system’s power supplies to operate at higher more efficient loading levels, especially at lower server loads. See Table 2 for details on the power consumption results with this feature enabled for 2U Twin systems at idle. The average power levels of each system were compared under maximum LINPACK loading. These power levels were then converted to TCO savings by using a conversion factor of USD $15 per watt saved over a 4-year period (see http://www.supermicro.com/white_paper/white_paper_DCO_calculations.pdf for calculation). The optimizations resulted in significant improvements in the performance— per-watt of the 2U Twin, to 19% over that of the standard 1U rackmount volume server used as the baseline. The power and cost savings are summarized in Table 3. Designed to satisfy the critical performance and power requirements of the rapidly growing Cloud and Hyperscale industry, Supermicro® servers optimized for performance-per-watt demonstrate superior results when compared to standard 1U rackmount volume servers. The most optimized Supermicro® 2U Twin with Titanium Level digital power supplies and PUE2 advanced fan speed control achieved a USD $517 savings per node over a standard 1U rackmount volume server. For a 10,000 node data center, this savings translates to over $5 million in TCO savings over 4 years. Cloud and Hyperscale operations seeking a critical competitive advantage should consider these optimized Supermicro SuperServer@ solutions as part of their business strategies. Supermicro® is committed to a long term roadmap of efficiency optimized solutions with the most advanced technologies and best TTM. ServerWare® is the premier local server solutions provider in Malaysia. With a large portfolio in our hands including entry servers all the way to hyperscale data center solutions and HPC/Big Data, ServerWare® has been working with broad customers in various different requirements. Accumulating large skill set to support various server computing industry. 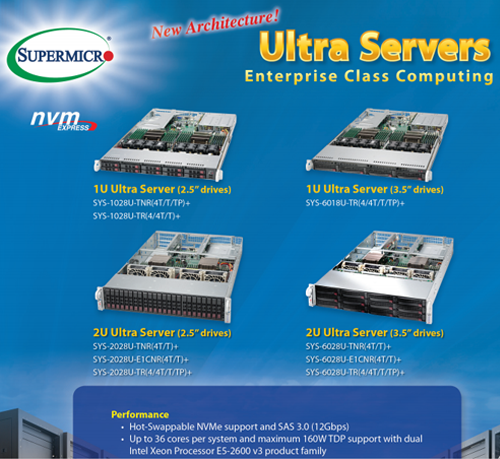 ServerWare® is SuperMicro® Malaysia distributor attributing to our success in a highly complex environment.